Our Early Childhood Enrichment programs offer children interactive, faith-based learning experiences that are as educational as they are fun. Learn more. 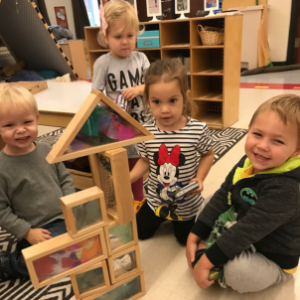 Choosing the right early learning environment for your child is a big decision. That’s why parents choose Hales Corners Lutheran School, where we provide a safe and loving learning environment with flexible scheduling options for busy families. Learn more. A child’s formative years have the ability to begin shaping who they are and will be for the rest of their lives. We are dedicated to helping each child develop spiritually, emotionally, physically, intellectually, and socially. Learn more. At HCL, learning and fun don’t have to end during the summer. Our Summer Programs offer great activities for children up to 6th grade. Learn more. A child’s formative years have the ability to begin shaping who they are and will be for the rest of their lives. We are dedicated to helping each child develop spiritually, emotionally, physically, intellectually, and socially. Along with a solid foundation in Christ, these are the tools children need to become lifelong leaders. Learning is promoted through modern teaching methods, using technology, hands-on experiences, and field trips. As one of the largest Lutheran schools in the country, we are able to provide students with programs in music, art, physical education, learning resource, motor lab, and many extracurricular activities, along with core academics. We are also able to offer an extensive athletics program and extended before and after school care for our students. Showing love for the Lord through generosity and serving others is instilled early in our students. The many servant events held throughout the school year, the variety of mission emphases chosen for chapel offerings and the collection of items for those in need are just a few ways that HCLS students work toward growing their servant hearts. Christian education relates God’s Word to every aspect of life. We seek to integrate it into every facet of curriculum throughout the school day, helping children nurture their personal relationship with God. Knowing they have a place in His kingdom helps our students discover the purpose He has for their lives. As we believe God has uniquely gifted each person to do good works which He expects His children to do, (Matthew 25:34-30; 1 Peter 4:10; Romans 12:3-21) we encourage our students to follow His example and to serve as Christ’s hands and feet in the world every day. A child’s first experiences in school are important to their learning and development. Our teachers are extraordinarily skilled in nurturing children while encouraging and challenging them to succeed. Teachers and students are actively involved in the learning process, resulting in a rewarding adventure where children are eager to learn, investigate, grow, and discover. For over 55 years, we have been partnering with parents/guardians and families to nurture Christian based education. We welcome family involvement and credit many experiences and opportunities enjoyed by our children to the active participation of the families in our school. Sharing common goals and interests, such as faith, creates strong bonds between teachers, students, and families. Reinforced by trust, respect, and honesty, the bonds that are formed at Hales Corners Lutheran School are ones that last a lifetime. Our teachers are sensitive to your child’s individual needs and are committed to the development of the whole child; spiritual, physical, intellectual, emotional, and social. Teachers are fully invested in the well-being of their students, building healthy relationships and trust that prepare them to lead responsible, purpose-filled live for Christ. National Lutheran School Accreditation (NLSA) evaluates the quality of academics, programming, and spiritual formation. This process helps schools define success and plan for continued school improvement. Exemplary schools have met and exceeded expectations of the NLSA through the accreditation process. Through quality academics and spiritual development, exemplary schools have proven themselves as leaders, developing and implementing best practices. YoungStar gives parents peace of mind and helps give their kids a promising start in life. As Wisconsin’s child care quality rating and improvement system, YoungStar gives parents the tools and information they need to raise happy, healthy kids. They also help preschools and extended child care providers give children safe, nurturing places to grow. A family of faithful servants, gathered together and sent out to make a difference in the world for Christ! Hales Corners Lutheran Church believes that education should glorify God and prepare students for a life of faithful and obedient service to Him. This congregation stands behind and supports the power of a Christian education, teaching that God is the source of all truth.